No strangers to big changes in their lives, Michelle and Ewa travelled to Thailand for the first time in 2000. They visited several elephant camps and decided that the Royal Elephant Kraal Village was where the action was. As they were very impressed by the work and the vision of the founder Laithongrien Meepan and his commitment to saving elephants in Thailand. 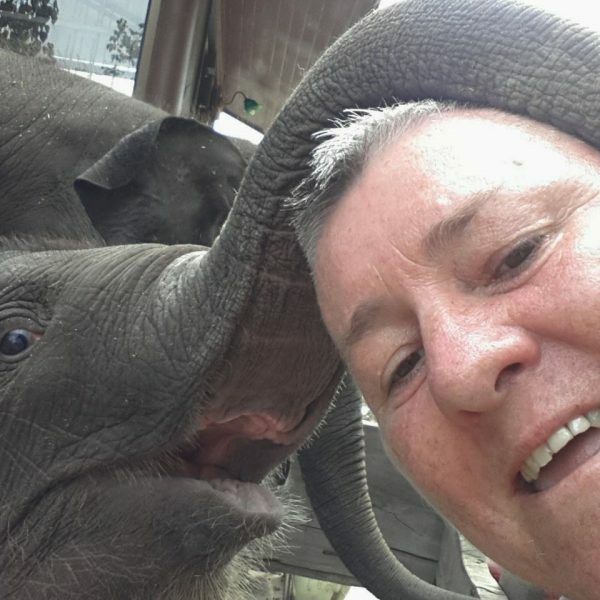 They returned several times over the next few years, including a six month stint when Michelle was the recipient of an Alfred Dunbavin Butcher scholarship from Zoos Victoria, to learn Thai techniques in working and training elephants. Of the many projects undertaken by the Kraal Village, one had been on Laithongrien’s mind for a few years. Retiring old elephants yet still giving them an income and people to care for them has been finally realised with the Elephantstay project. 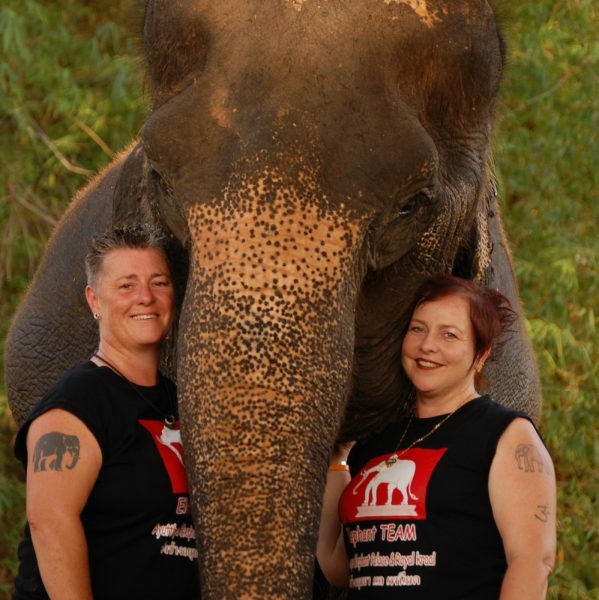 Michelle and Ewa sold their worldly possessions and moved to Thailand to found and manage this project which became Elephantstay. 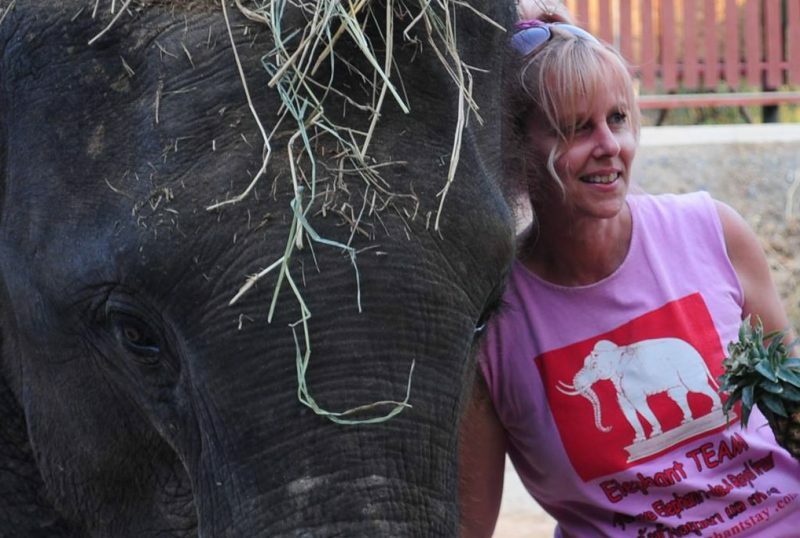 “I worked with 19 elephants in 6 months in 2004-5 to gain as much experience as possible. 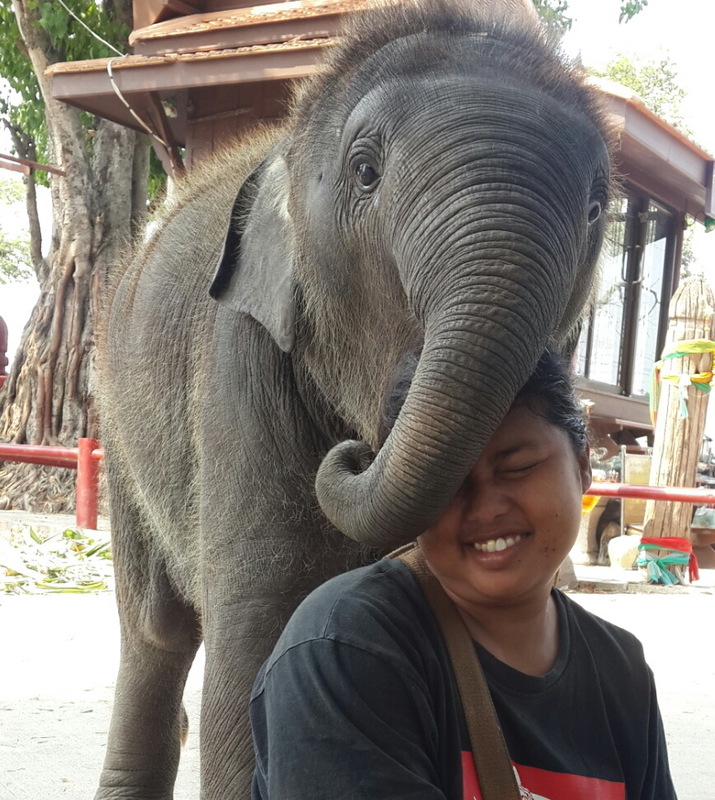 Dok Mak was my first elephant and I cared for her the entire time, she remained my favourite and even though she has passed she remains my biggest inspiration. Dok Mak’s gentle yet strong personality gave me immense pleasure and taught me a lot. Most people who saw her large bulk instantly assume she was pregnant and I had to continually reiterate ‘No, she is over 80 years old and just loves her food, Dok Mak enjoyed the company of the biggest and strongest bulls. “Watching a newborn elephant calf take its first steps is an awesome and inspiring sight. The way the entire village rallies around to help the calf and the mother and be a part of each new life reinforces how elephants unite a community. The mahout is always so proud. I love to share the joy of this event with people, it truly is fantastic. And with 68 babies born since 2000 and always having pregnant elephants, you may experience the miracle of life. Laithongrien Meepan is a world renowned Elephant expert. Born in 1958, a qualified zoologist and has a Masters Degree in Community Development. He is the Founder and Director of the Ayutthaya Elephant Palace, Royal Elephant Kraal Village and the Phra Kochabaan Foundation. He has lived on site in the village with the elephants overseeing and directing everything since its inception. He is one of the world’s foremost experts on Thai elephant history and culture. Meepan is the largest private elephant owner in the world, with over 200 elephants. He is the foremost world expert on domestic elephant breeding, having bred 69 calves successfully since 2000 through natural breeding. His expertise extends to training, unique nutrition development and meeting the special needs of elephants of all ages, character and temperaments including successful retraining of elephants that have killed people, to live in free contact with humans. 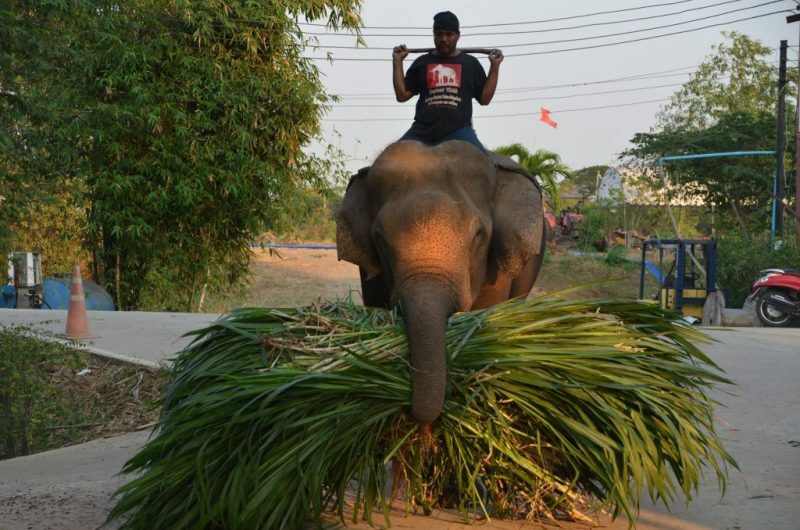 Meepan personally researched and started a farm to grow special food for elephants. Specialising in training elephants for films, Meepan has worked with many prominent actors and directors including Jackie Chan and Oliver Stone. In addition he trains elephants for theatre productions that include re-enacting elephant fights during war time. He was the consultant on the Blue Elephant, Thailand’s first animation feature about elephants and their role in Thai history. Meepan also advises and assists the government departments on elephant problems. This includes advice and solutions for street elephants, and wild elephants that have been injured and require relocating and rehabilitation. He also negotiates with other elephant people and with the government to improve laws to protect elephants and mahouts. 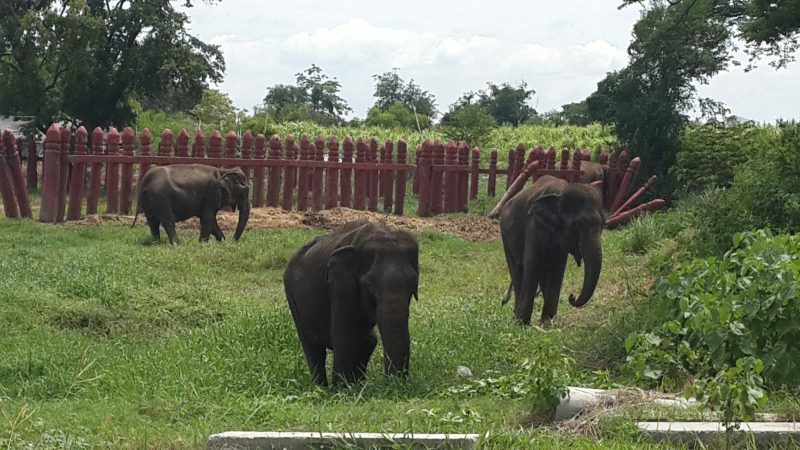 Most importantly Meepan encourages the development of mahouts and staff to raise the status of elephants and their keepers to the noble position they once held in Thai society. Hello I’m from the USA and have worked with a variety of exotic animals in zoos and other zoo affiliated facilities. Specifically, I have worked with elephants in both the US and Zimbabwe. I have always had a passion for elephants and am proud to be apart of a team that’s focused on the well being of these animals, as well as the men and women who look after them. I’m excited to share my passion and knowledge with you! G’day! I’m from Australia. 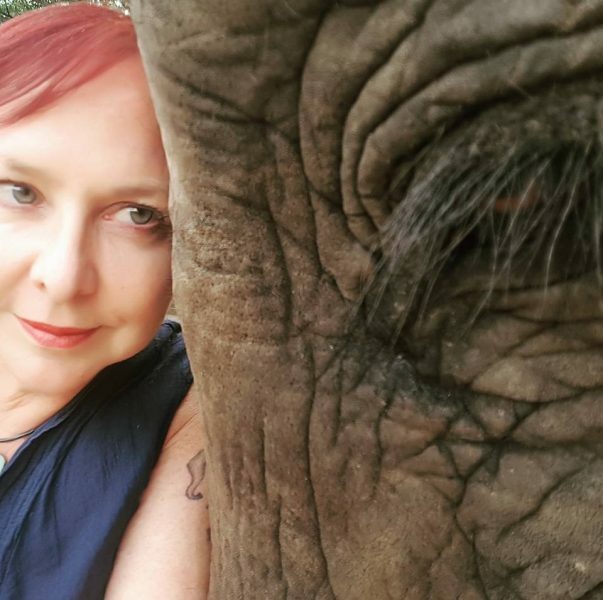 I manage our social media presence; public relations, and conduct research for Elephantstay and the Royal Kraal. My professional qualifications are in academic research for the past twenty years, social media/online reputation management, and veterinary support assistance. I have worked in animal welfare for more than two decades. 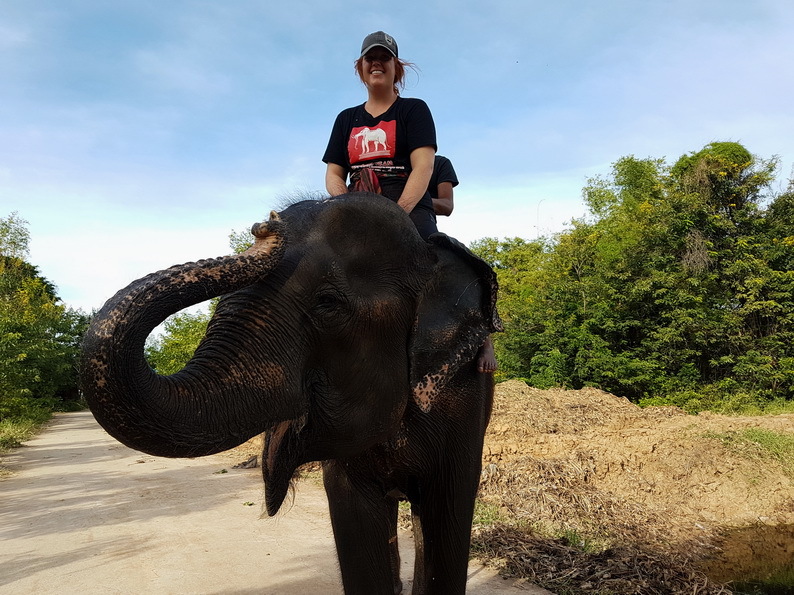 During that time I have gained extensive knowledge in elephant anatomy and physiology both through expansive research and working directly with elephants. I look forward to sharing my knowledge about elephants in person or online! 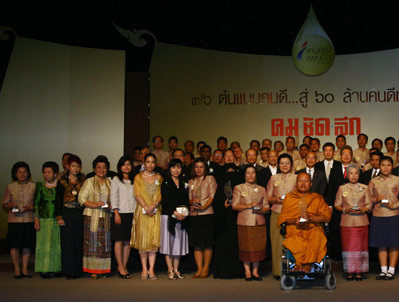 The Phra Kochabaan Foundation was established by Laithongrien Meepan in April 2005. Our mission is to conserve, help and protect Thailand’s elephants and to encourage the culture of nurturing elephants. One of the main projects is advising assisting and colloborating on new legislation to benefit all elephants. The new identification papers and DNA for domestic elephants was one step to help protect elephants and combat illegal trade. Now more extensive legislation is required to address welfare standards. Welfare standards for elephants will be officially stipulated in the new legislation for the management and husbandry of domestic elephants. The reason the date of issue for the legislation has not yet been determined is because the experts are still in discussion about the exact contents. The primary goal is for the new legislation to well and truly serve elephants and elephant people, and that is why the drafting process is taking so long as elephant people continue to contend with bureaucratic agendas. The welfare standards in discussion are, for all intents and purposes, very idealistic, with well-rounded rules and regulations that elephant facilities must follow. With regular inspections that will be carried out, elephant facilities must prove that they are following the rules if they are to be granted a license to operate. The new legislation must embody such ideals, for elephant people will settle for nothing less. There are three collectives of experts who are in ongoing discussion about the issues concerning elephant welfare standards. Some of these experts are on some form of government income. Many of these experts either have their own practices, or run their own facilities/businesses/community cooperatives. These experts are the ones who will set these standards that are to be stipulated in the new legislation. The cultural collective: This collective fully supports and promotes the expansion of avenues for traditional elephant-keeping communities around the country to earn good income. Such communities are the keepers of ‘cultural elephants’ — those elephants who have a cultural presence, and perform the role of hosts and participants in ceremonies and festivals. The purpose of this collective is to ensure that traditional elephant-keeping communities can earn their income as smoothly as possible, without having to deal with obstacles and unreasonable restrictions imposed by government departments/bureaucrats. This collective also looks after trust funds for elephants, holding and managing assets accumulated from cultural activities and rituals. The legal collective: This collective does legal research and takes action against individuals and organisations that have proven to be a danger to elephants and elephant-keeping cultures. Very importantly, this collective provides legal assistance to elephant owners whose elephants have been wrongfully taken away from them by government bureaucrats. So far, the predominant role of this collective has been to defend elephants and elephant people from any perceived threat, including threats in the form of misinformation on social media. The veterinary collective: This collective fully supports the use of traditional tools and techniques, especially in the medical treatment of elephants. They answer the question: “What is considered a healthy environment for domestic elephants?” This collective also determines the principles of proper elephant husbandry, as well as the criteria for healthy working and living conditions for domestic elephants. With scientific evidence openly laid out, the experts of this collective confirm the necessity of the use of traditional tools and techniques in the successful operation of an elephant facility/business/community cooperative. We have decided to start this page as there is lots of information about elephants on the internet. It is easy to find all the basic facts about elephants, how much they eat, how big they are, gestation period, what they eat etc. 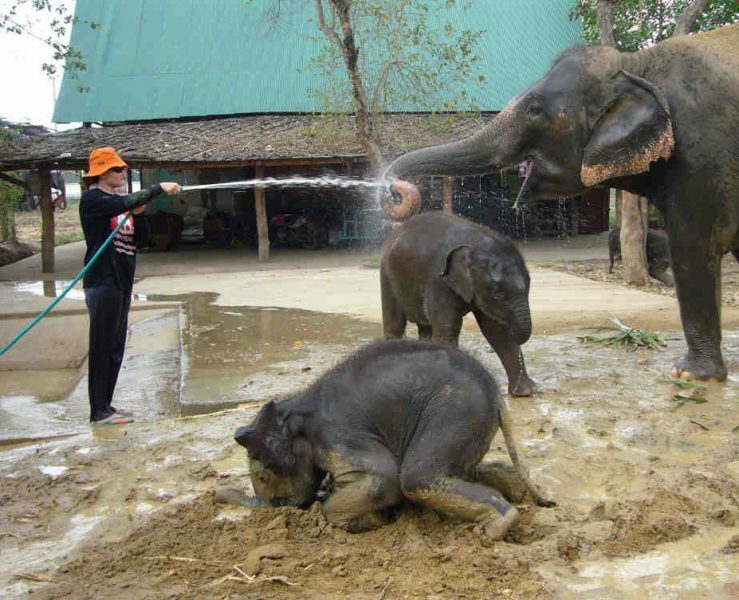 BUT there is virtually no information about the reality of people living and working with elephants. There is alot of misinformation put out by animal rights groups but their rhetoric doesn’t look after or feed elephants everyday. WE DO, as do others that have elephants in their care. The last gainful employment for elephants was in the logging industry last century. With the ban on logging in the late 80’s, elephants were left with no way to earn a legal income. Some people continued to log illegally as they could not access alternative employment. Tragically led to some unscrupulous owners feeding their elephants amphetamines so they could work all night. Not good. The Kraal has bought elephants addicted to amphetamines and it is virtually impossible to get them off it if they have been on them a long time, so tragically some died, and others only lived a couple of years. Tourism is much easier work than logging. Every elephant in Thailand relies on tourism for an income. Burmese statistics are very thorough about logging elephants and elephants log only live on average into their fifties. Our retired elephants are in their 60s and 70s, and our oldest is over 80 years old. By not logging for over 20 years their life span has increased. Tourism and now our Elephantstay program has actually prolonged their life as we have the income to buy the medicines and care they require if they get sick. In addition one of the reasons elephant population has declined so drastically in the last 20 years is because they have not had the means to earn an income. There is no reason why people should not make money from elephants. People who do are no different from others who make money, people need money for food, housing, families, schooling, medical care etc, the people who own elephants have these needs as well. Without tourism the numbers of elephants would have declined even further. Look at Myanmar now, they are reducing logging to the point where elephants are in a precarious situation and their future is in jeopardy. 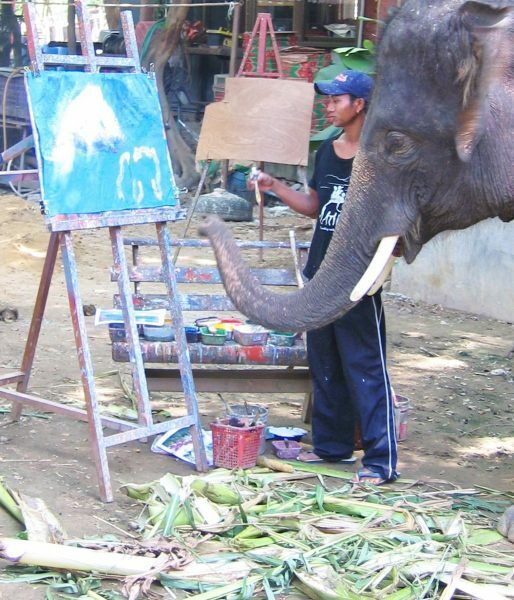 Elephants love to paint because they get to do a fun activity with their mahouts. They get huge amounts of attention, positive reinforcement and treats from their mahout and so of course they are going to enjoy themselves. We only use younger elephants and it is amazing to watch how everyone plays together in between and physically and verbally show their love to those they associate with this activity. These type of activities demonstrate the close bond between elephant and mahout and anyone can watch and see how it benefits and enhances the relationship. People are amazed to see how dextrous an elephant is with their trunk. After all they have more muscles in their trunk then you have in your whole body! Elephant painting is a collaboration between the elephant and mahout and we love to see the mahouts develop their artistic side as much as the elephants. Its a fascinating and fun look into how we can develop and create opportunities for both the mahouts and elephants. The Kraal has successfully bred 68 elephant calves since February 2000. Nearly all our mothers gave rides to tourists up to the time they gave birth. Going into town and giving rides means the mothers get to socialise and exercise up to the time they give birth. This is obviously most important for their mental and physical well being. Elephants that do not work get bored, frustrated and physically out of condition. The success of our breeding program proves that giving rides to tourists is positive and enhances successful birth success rates. 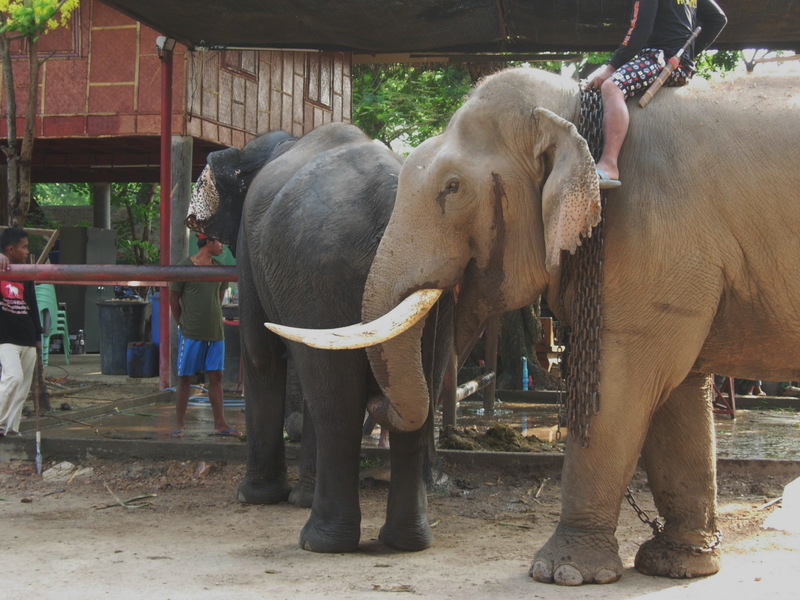 For more comprehensive information about elephant riding please see Riding elephants facts. Getting pregnant and having a successful birth for elephants is similar in principle to humans. If women are stressed they find it hard to get pregnant, the same can be said for elephants. 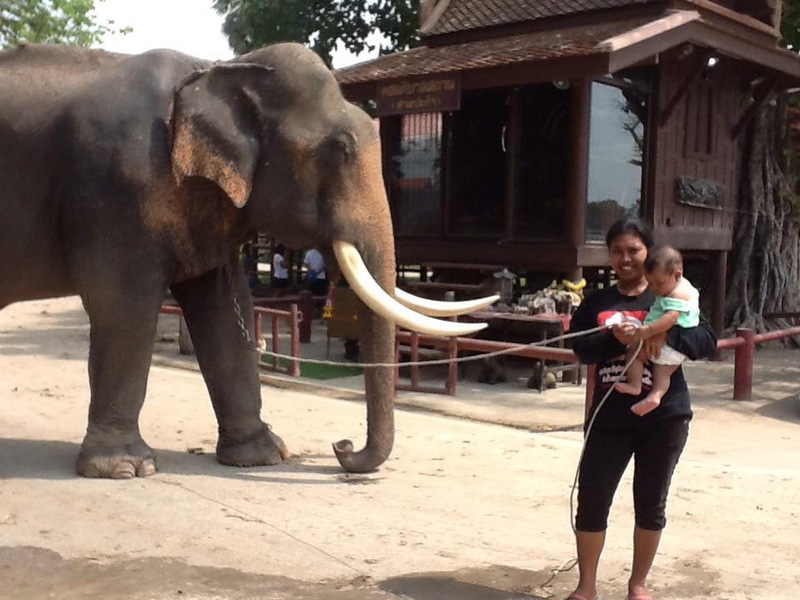 So even though our elephants, as all the elephants in Thailand, are sometimes tethered and have mahouts who carry a takaw, they still get pregnant and have healthy babies. Because neither of those practical tools are detrimental to the elephant’s physical and psychological well being because they are used humanely and correctly. Seventy successful births since February 2000 is proof that happy, healthy elephants breed. The majority of elephants are very well treated. One has to remember that the mahouts and the owners have invested a huge amount of time and money into these elephants and if they are not taken care of they will have nothing. It is not even logical to believe that people abuse their elephants to the extent many animal rights group would have one believe. In the west the amount of money that is spent on rescuing all types of animals is astronomical. In Australia alone the RSPCA spends 80 million dollars a year, trying to protect animals. In Brisbane alone 1,000 cats and dogs are put down a week. 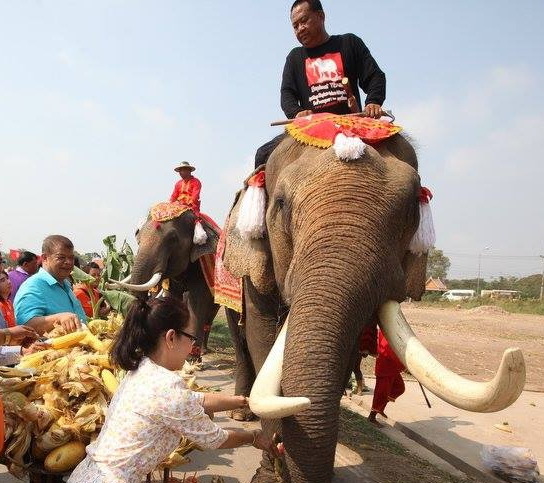 If such a rich country has so many issues with animals, it is hardly surprising that there will be a percentage of people that dont take care of their elephant to the highest standard in Thailand. The time and effort it takes to create a bond with an elephant and this can only be done by the most dedicated and committed. Any one who does not put their heart and soul into being a mahout will not last. Mahouts are people like everyone else and yes, sometimes they might hit their elephant, but please remember there is a huge difference between discipline and abuse. Abuse is not tolerated by real elephant people. Elephant people want to be respected like everyone else which is why we work together to make this a noble honorable profession that requires skill and expertise to be successful. Every profession has their good and bad. We should all be striving to be the best we can and compassion and understanding can go a long way to helping and making improvements where there is need, criticism rarely if ever works. There are only about 4,500 elephants left in Thailand. Most of these elephants live with people. There is barely enough jungle to support the wild populations that exist now, let alone any real increases. The reality is that elephants have a far greater chance of surviving into the future if the domestic populations are supported. Mahouts and owners need incentives to breed. If animal organisations paid money to elephant owners to breed and look after the mothers and babies then that would be a start. Without financial help, people can not be expected to bear a burden they cant possibly afford. 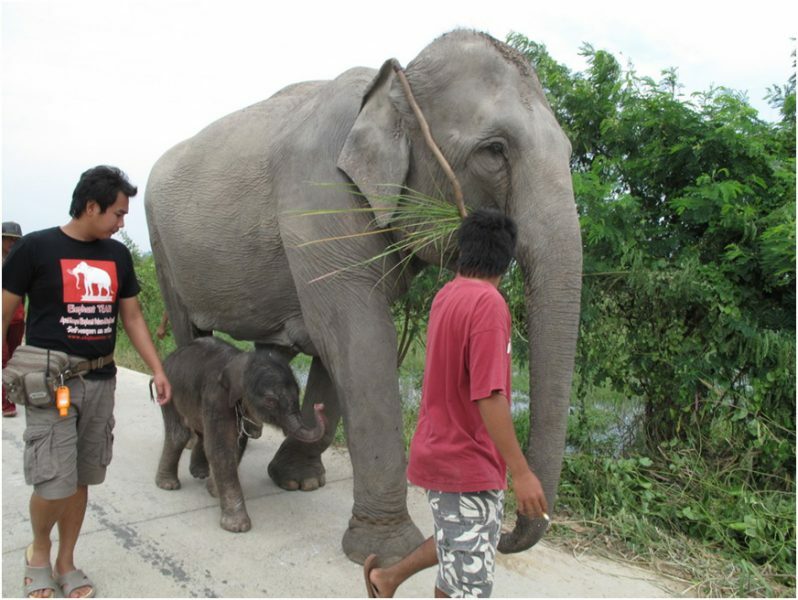 Mahouts have families, to support as well as elephants and that requires money. The elephants are required to earn an income, if they are only costing the owner money then how will anyone survive into the future? Elephants, like any other domesticated or captive animal rely on people to feed them, take care of them and look after them when they are sick. To be put back into the jungle is impossible for the vast majority of elephants. Unless they have lived a large portion of their lives in the jungle, elephants have no idea how to survive. A decade ago WWF released 80 elephants into the wild and within 5 years they all died. We need to learn from these tragedies not repeat them. When a baby elephant is separated from its mother, there is naturally going to be some resistance. However many of us have witnessed the tears and tantrums of children on their first day of school. Elephants require training the same way children require schooling. They require patience love and understanding. They require sacrifice and commitment. As there are so few elephant left it is important to remember that elephants are continually going up in price. The Kraal Village bought a sick mother whose milk had run dry and her 6 month old baby and it cost 1.2 million baht. Fortunately the mother started producing milk again the very next day as the other mums reassured her that this was a good place and she would be well taken care of. Elephants that live with people need to be confined in some way. Elephant proof enclosures cost millions of dollars. Chains are a cheap and practical alternative that keeps the elephant and people safe. What most people dont realise is that elephant are incredibly strong and could break out of the chain if it really wanted to. However if the elephant is being cared for, ie fed, watered, bathed, excersised and being taken care of, it has no problem spending some of its time chained. After all, elephants in the wild, dont walk around looking at the scenery, they look for food and water. If elephants were not tethered they would be walking anywhere they want. They can destroy other people’s trees, farm land, or orchards not knowing those are not for them to eat.If they become a pest they can get killed or poisoned or injured or at the very least be resented. 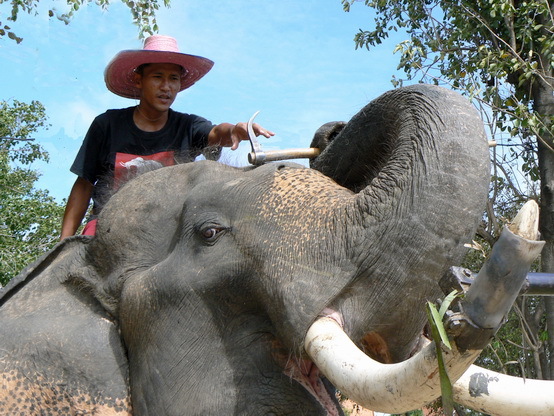 Human Elephant Conflict is the biggest threat facing elephants in the wild in Thailand. We can keep our domestic elephants safe from this.Mother elephants are also chained while in the fenced areas because they can easily push the fence or climb over the fence and this causes distress for the baby. Which in turn causes distress of all the mothers and babies in the nursery. Chains are necessary to keep the elephants safe from harming each other (not all elephants like each other) and other people, The advantages of chains over other means of tethering are overwhelming. Chains do not stretch or shrink with changes in heat or moisture. Chains are stronger than the alternatives. Chains, unlike rope or wire, are very unlikely to cause wounds and to get twisted up in knots or caught up in trees or rocks. Chains are very durable and last longer than the alternatives. They are easy to keep clean especially during the rainy season when it is muddy. They don’t stay wet so the elephant skin is unaffected by rubbing of wet material. They can easily be adjusted to size to fit properly.Chains mean elephants can be easily moved around and can go anywhere, with their mahout. They can go to the river, or go outside the village to grassy areas and eat in different spots. They can go to work. 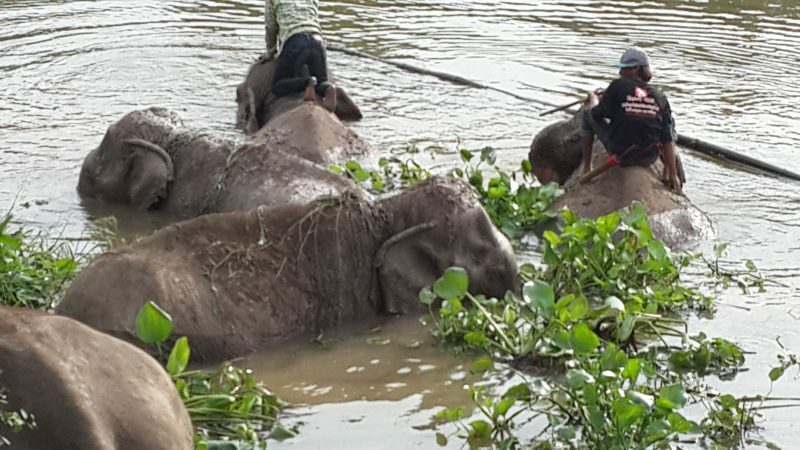 Elephants can also have a visual presence in everyday life with their participation in festivals, parades and public events.We have been flooded several times over the last 16 years because we are located on the Lopburi River. The chains meant we could relocate as many times as necessary quickly and easily. If the elephants were not used to chains and being moved around they would have suffered distress and the mahouts job would have been far more dangerous. Thai people understand the world in symbolic terms. The elephant takaw is an instrument that has great meaning beyond its superficial use. It represents ancient teachings and has cultural significance that western values ignore. Too often western culture only sees the takaw in visual terms without any deeper historical or cultural meaning. 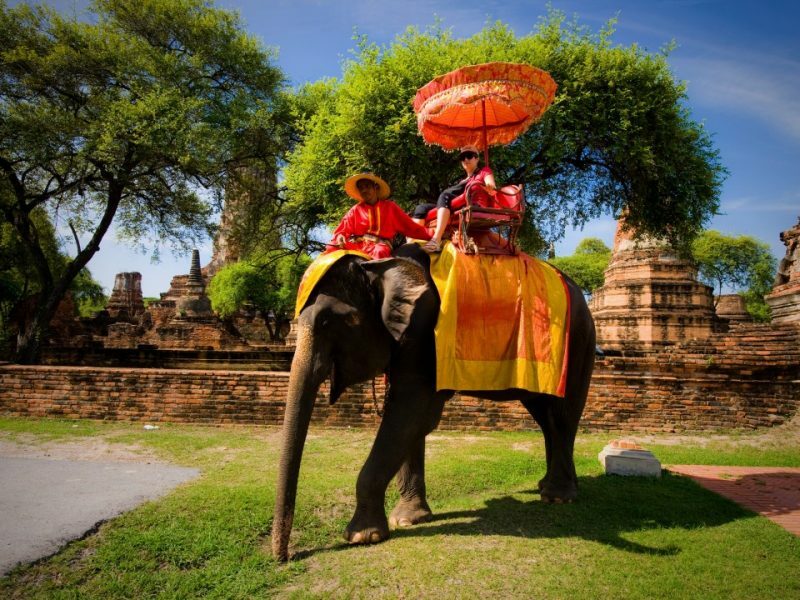 There is no elephant culture in the west and there is no history of elephants living with people so it is difficult for western society to understand how the takaw is used and its significance to Thai elephant culture. The takaw (bullhook or ankus as it is also known) is a much maligned and misunderstood instrument, probably because of its appearance. In elephant-keeping cultures where the takaw is standard, good mahouts very rarely use their takaws – or at least very rarely use them as it appears they must be used, in a slashing or stabbing motion. In fact, the takaw, so long as neither the weight nor the point of the head is used, is simply a light stick with a metal head shaped to a point. Even the point has a very subtle and gentle purpose; each mahout will have his takaw forged so that it ‘grabs’ elephant skin perfectly to his taste, allowing him to both extend his reach and to pull or tug into himself. 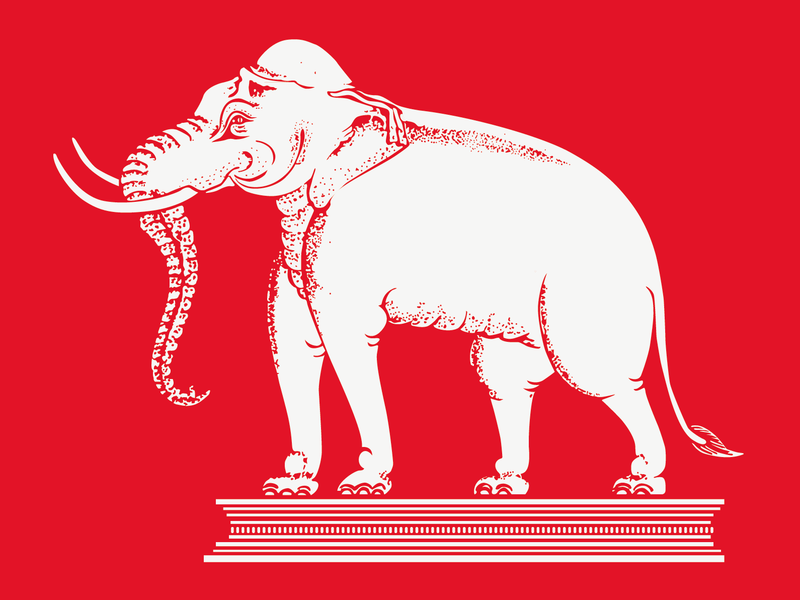 The mahout, even afoot but especially mounted, is enabled to ‘signal’ otherwise unreachable control points on the elephant’s body. ‘Takaw commands’ are often more readable and able to convey nuance to the elephant than are either voice commands, feet commands, or ‘whole body commands’. Takaw commands can be used to augment a voice command, perhaps by modulating the speed or direction. At no time, in proper use, does the takaw break or bruise the skin. It is undeniable, of course, that a larger pain-causing potential lurks in the takaw, a reserve should an elephant go truly out of control. In reality, while the potential for pain in a takaw is vital in medium-level confrontations between elephant and mahout, a takaw matters for little when an elephant really goes amok. 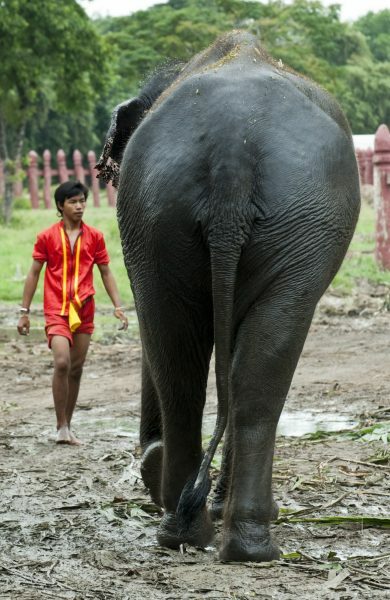 A Thai mahout interviewed told of one day, at the request of a friend in need of some protection, sitting on the neck of a tusker of bad reputation while the friend inspected its front feet. The bull suddenly slammed the friend to the ground with his trunk and rapidly and repeatedly gored him. 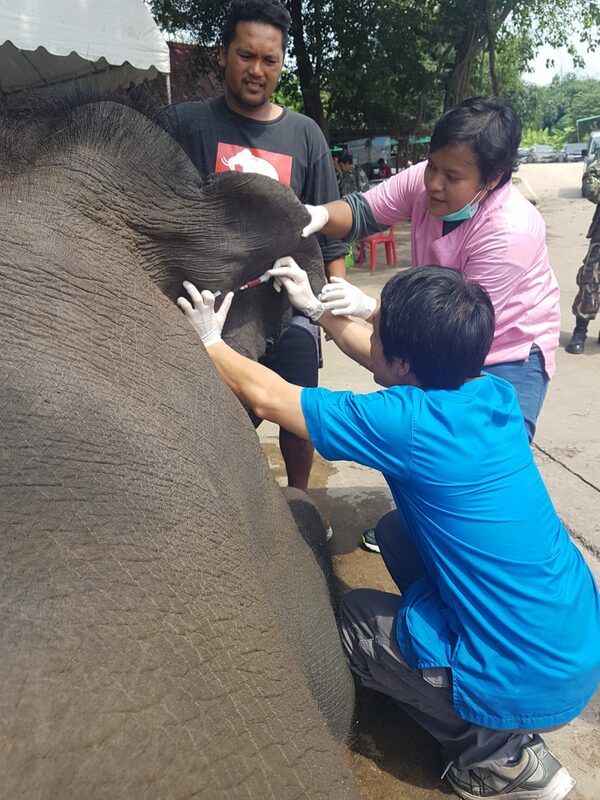 The man on the neck first tried to slam the point of the takaw into the auditory canal to puncture the elephant’s eardrum and when that failed, scrambling to stay on, he tried to stab into the right eye. But inside of fifteen seconds, the man on the ground was dead and the takaw had done not a bit of good. In short, when used properly the takaw is a far more subtle and versatile tool than it appears, and in dire emergencies the takaw is a far less painful and powerful weapon than it appears. Hooks have been used to inflict needless wounds, but the cause is invariably poorly trained, poorly supervised, and poorly motivated mahouts rather than any cruelty intrinsic in the takaw. (If such men did not have takaws they would use machetes or whatever weapon lay close to hand.) The correctly used takaw is a conductor’s baton, not a policeman’s truncheon. 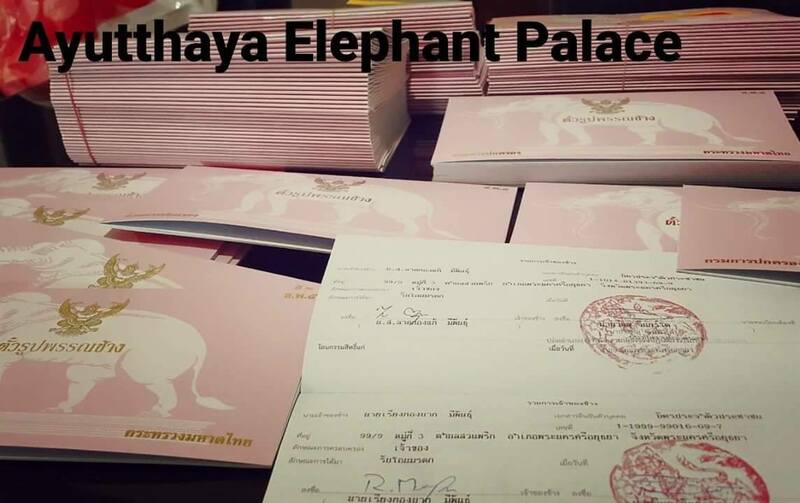 We are very proud to be issued the new national Elephant Identification papers. Due to our founder, Laithongrien (Pi Om) Meepan’s vision and efforts, the government adopted his idea for a centralized system that ensures all legal elephants are issued with these comprehensive ID’s that act as a passport and will be used to monitor ownership, all travel and even bull elephant’s ivory! In recognition of Pi Om’s invaluable knowledge and contribution to the new system, the government used the same logo as we do for the design. The colour pink is the official colour of the King of Thailand. This new computerized centralized system will certainly impact the illegal trade, capture and use of wild elephants and the illegal ivory trade. New born elephants will need to be registered within 30 days of birth which will also help to protect all elephants. Only by working together can important changes be made. The second phase of national Identity project was to take DNA samples of every domestic elephant. This now means a comprehensive data base will be available which can potentially further protect wild populations and ensure genetic diversity. Dozens of people from Department of National Parks, Livestock Department and Local government came to the Royal Elephant Kraal to start a DNA project. Every elephant in Thailand was checked. They began the project here as we are leaders in the elephant community and because we have always co-operated well with the government. They needed us to help sort out all the issues co-ordinating between the departments to test the elephants to make this a success.